Ensure that your electrical systems are up to date, working appropriately and meeting the needs of the tenants. As a property investor, property manager or body corporate manager, your goal is to keep every rental home, park home, or apartment safe, functioning efficiently and cost-effectively, and tenanted. PRF Electrical are your experienced Strata & Real Estate Electricians in Perth. At least two Residual Current Devices (RCDs) must be fitted to the electrical switchboard of any residential rental property, and must protect all general power and lighting circuits. The RCDs must be tested every three months. The tenant can usually carry out the test but unless you’re sure you can rely on them, it may be better to have the test done by your regular maintenance provider. Read more: RCD requirements in rental properties. Smoke alarms must be installed in every rental property prior to the tenancy agreement being signed. The alarms must be less than 10 years old and hard-wired to the mains electrical supply. They must be tested at least once every year. Since 1 July 2015, most residential rental properties require an electrical light at, or near, the main entry. The device must be operable from inside. Read more: External lighting requirements. We respond quickly to every need, whether it’s inspections, new fixtures, maintenance or repairs. We’ll call or message to let you know when we’re on the way. We guarantee to complete the job quickly, professionally and reliably. We provide only the most reliable parts and components. Our reporting system provides photographs and signed forms digitally for your compliance obligations. 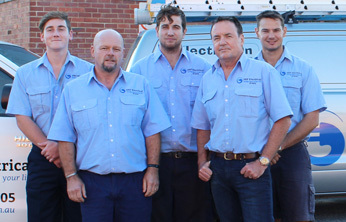 Our electricians are fully qualified, they work safely and efficiently, and our rates are highly competitive. You can face significant fines for non-compliance with the electrical requirements. So, if things do go wrong, you need to know that your electrical team will fix it fast and affordably, but above all properly. This is where PRF Electrical comes in. PRF Electrical can check if any property you own or manage meets the standard, and make the necessary additions or repairs to ensure that the property becomes compliant. PRF Electrical provides a standard Electrical Condition Report (Visual) as a record of our testing and inspection of properties to look for non-compliant and unsafe electrical situations. We provide an annual inspection service to keep all electrical systems compliant and functioning properly or we inspect your property prior to sale or rental. The easy way to get to know how exceptional our service is, is to give us a call and get a quote on a job. Any job. Download our free Electrical Condition Report. Fill in the statement of acceptance and email us the form to book an inspection. Contact us as needed for installations, inspections and repairs. Or give Phil and the team at PRF Electrical a call today on 9330 2505. You can engage us to schedule and complete regular inspections and maintenance on your rental properties. This way you can rely on us to keep all of the electrical systems working, up to date and compliant. Give Phil at PRF Electrical a call today on 9330 2505 to discuss this arrangement.